The European Union Film Festival (EUFF) is a highly anticipated annual event that celebrates cultural diversity and the appreciation of international films. In collaboration with Golden Screen Cinemas (GSC) Malaysia, the EUFF screened 21 award-winning films from 18th October 2018 to 28th October 2018. One of those films, “Loving Vincent”, is a film that is essentially a love letter to Vincent Van Gogh’s life and legacy. Set a year after Van Gogh’s suicide, the film follows Armand Roulin, the son of a postman, Joseph Roulin, as he travels to Paris to deliver Van Gogh’s last letter to Theo, Vincent’s brother. Armand reluctantly accepts the task after his father’s persistence. His journey to send the last letter introduces him to various characters that had been a part of Van Gogh’s life. Under the pretence of delivering the letter, Armand tries to uncover the reason for Van Gogh’s suicide from the characters he meets. One has to begin by praising the extensive filmmaking process taken by director and painter, Dorota Kobiela. The filmmakers chose a form of animation; rotoscoping —a technique where a live-action cast was filmed over a green screen and the background superimposed after filming. They went the extra mile by having artists paint over each frame of the film. Classically trained painters over conventional film animators were chosen, along with 125 painters from over twenty countries. The entire film was composed of 65,000 oil paintings on canvas with each painting making up each film frame. Painted in Van Gogh’s signature art style, his legacy was truly honoured. Broad strokes and vibrant colours swirled on the screen as we followed the film’s story. 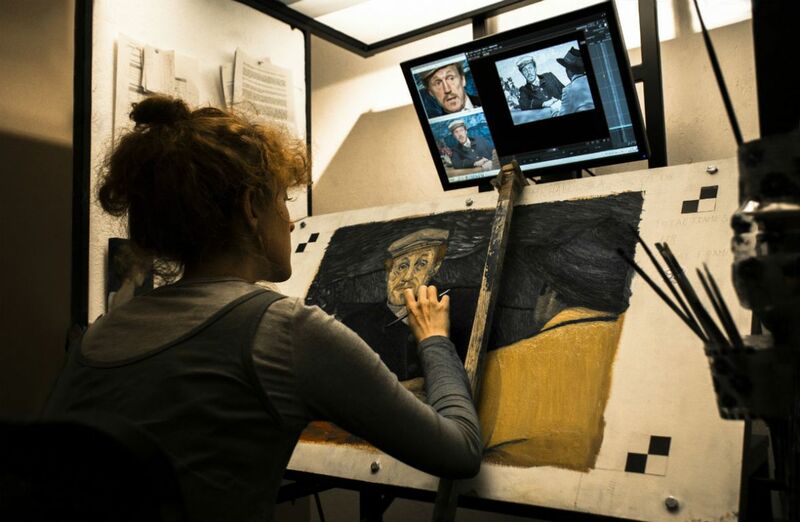 Whereas, flashbacks to moments when Vincent was alive were edited and portrayed as black-and-white pencil sketches, adding contrast to the real-time events of the film that were in colour. Having every frame painted with oil on canvas might seem unnecessary. However, the painting’s aesthetic does have a tremendous effect on how we watch the film. It does not get saturated or weary even as the film approaches its ending. It instead gives us a glimpse of the way Van Gogh might have seen the world through his gifted eyes. It makes us frame even the most mundane things like everyday life in an interesting and almost intriguing way. That, I believe, is one of the successes of the film. It showcases the hallmark of the Impressionistic era of art whereby everyday life is put into the forefront of the artistic world. Another outstanding aspect of the film is the beautiful and unpredictable storyline. One of the things the filmmakers explored with the story is the theory of Vincent Van Gogh not actually committing suicide. Instead, it was him being shot by a mischievous teenager who belittled and bullied him for living in Auvers-sur-Oise. Piecing together the different encounters with Van Gogh truly gives us a more wholesome image of his character, worries, eccentricities, sources of happiness and most importantly, the impact and joy he left on the people around him. This film is truly an embodiment of Van Gogh in both its story and production. It is a testament to his underappreciated ingenuity felt throughout his lifetime. For that, it is, truly, a love letter to Van Gogh.